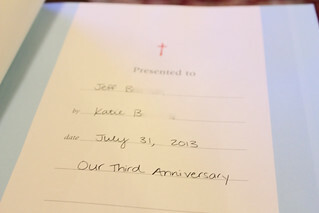 I just realized I never wrote about our third anniversary. So I'm going to go ahead and document it now... even though it's been almost four months since then. Oops! We did actually exchange gifts and cards in the hotel room that night, but it was more like a study break than an anniversary celebration, so we rescheduled the celebrating portion of our anniversary to a later date. Because we left for our Alaskan cruise so soon after the Bar exam, we decided to officially celebrate our anniversary in Seattle! 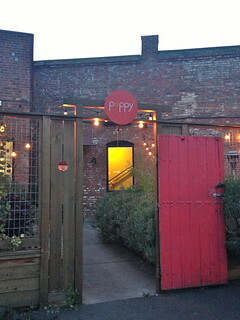 We picked a fun restaurant called Poppy, and we had such a great time sitting in their herb garden and eating "thalis"! 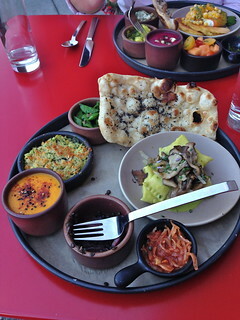 The food was absolutely delicious! I always get Jeff a present that goes along with the traditional anniversary gift for that year. The traditional gift for third anniversaries is leather, and I've actually been waiting for this one for a while... ever since I first saw leather as year three, I've had it planned! 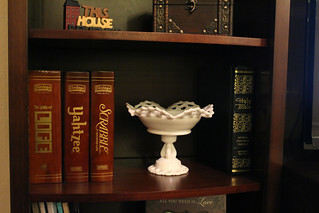 I got him a (leather bound) family Bible (it's this one), imprinted with our last name. 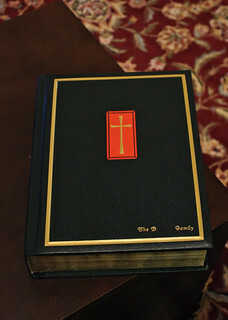 We have plenty of Bibles around the house, but I wanted us to have an official "family Bible." 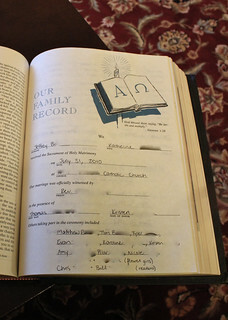 It stays in our living room where we can get to it easily, and it has lots of fancy pages in it for recording things like wedding dates and baptism dates and family history. 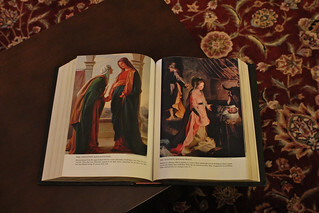 It's a really beautiful Bible with lots of illustrations and a pretty large font. We can't wait to use this Bible for reading the story of Jesus' birth on Christmas morning and other fun tradition-y things like that! 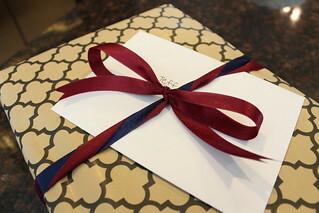 I always wrap Jeff's anniversary gifts in our wedding colors, navy and burgundy. 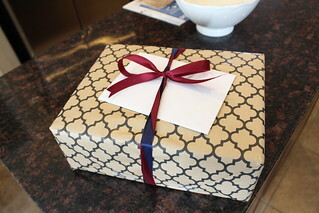 I used the last of the burgundy ribbon this year though, so that may be the end of it. We'll see. 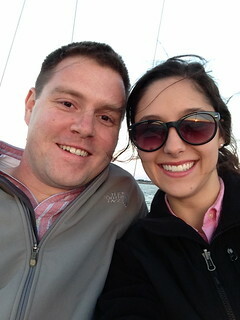 Jeff's gift to me was a sunset sailboat ride! You know how you sometimes talk about the wayyy distant future and brainstorm fun things? Well, when we do that, we always toss around the idea of maybe someday, when we retire, learning to sail and buying a sailboat and spending a portion of our time living on our sailboat. I had never even been sailing though, so I honestly had no idea if I even liked it. So it was a really sweet gift from Jeff to get to go try it out! 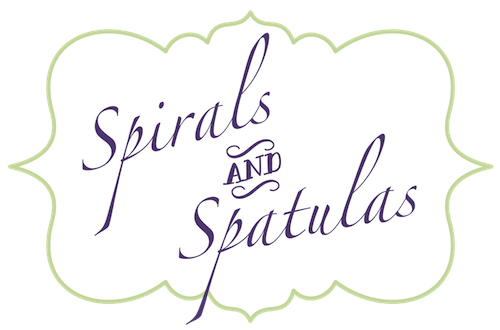 Due to assorted scheduling problems, we didn't actually get to go until just a few weeks ago. We drove out to Clear Lake and rode a sailboat with a captain for a few hours. 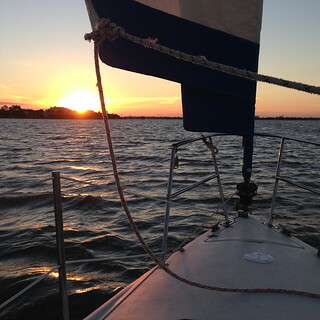 The sunset was just absolutely beautiful on the water, and it was fun to get to see how the whole sailing thing works! So, in the end, it was kind of like we got three anniversaries this year (our actual one in July, our celebration of it during our trip to Seattle in August, and the sailboat ride just recently)! Such fun. 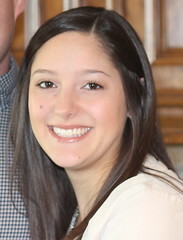 Yay for three years of being married to my best friend (and many more to come)! 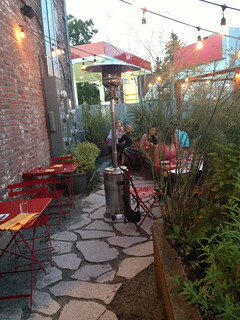 Oh, and just for fun - here's how we celebrated our first anniversary, and here's our second! 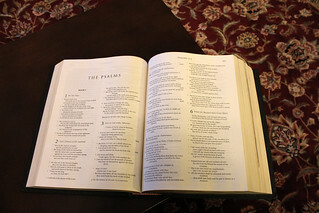 What a beautiful Bible (and a great idea)!